Connector plugs and receptacles are insulated with durable, impact-resistant Neoprene™ rubber. These Safety Plugs provide electrical lockout during maintenance. Two pin connector feature a unique plug and receptacle design that prevents mismating. These interlocks fits standard FS or FD boxes. 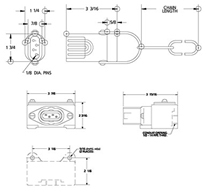 Female and male Interlocks are a shorting plug safety devices. These lockout plugs have two poles, and provide a complete portfolio of automation infrastructure products. This interlocks are ruggedly designed, engineered and constructed to provide easy installation and long-term, reliable performance in harsh environments. Whether you are connecting power, industrial networks, or automation equipment. Male shorting plug with 1’ chain to keep it closed when it is not in use.